The ZoomSHOT 20 QSR System from Vaddio includes ZoomSHOT 20 HD camera with thin-profile wall mount, quick-connect short range video interface, IR remote commander, and power supply. The Vaddio ZoomSHOT 20 HD camera is a native 1080p60 resolution camera that features a 1/2.8" Exmor high-speed, low-noise CMOS image sensor technology. This point-of-view camera includes 2.38MP total and 2.14MP effective pixels providing drop frame and non-drop frame resolutions of 1080p, 1080i, and 720p. The ISP combined with the Exmor image sensor achieves an impressive low-light performance of 0.3 lux (color) and 0.03 lux (B/W). The ZoomSHOT 20 can be used stand-alone with the Vaddio AV Bridge MATRIX PRO with built-in quick-connect interfaces or with the included quick-connect interface option. It also comes with a thin-profile wall mount. 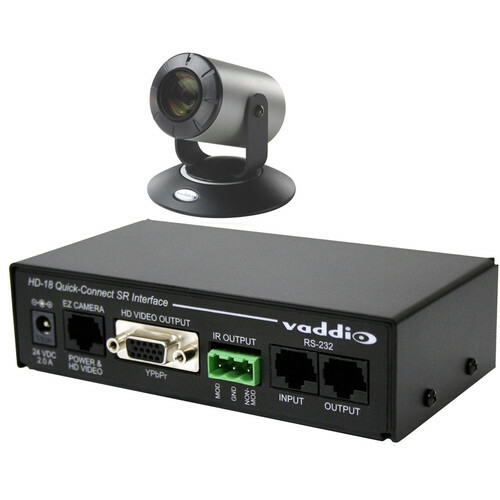 The Quick-Connect Short Range Video Interface from Vaddio allows you to install and power remote Vaddio cameras. With a single Cat-5 cable, it connects with the camera. The interface powers and controls the remote camera and receives HD video from the camera at up to 150' away. The Short Range Interface provides a local access to an HD monitor via a 15-pin D-Sub connector as well as infrared connectivity. The IR infrared output allows you to send IR remote controls to third party equipment, such as video-conferencing codecs. The IR signals can be transmitted as either modulated (through the air) or non-modulated (wired) signals. The Vaddio IR Remote Commander for Vaddio/Sony Camera Packages controls the various pan/tilt options of the camera such as pan/tilt reset, reverse pan direction, and standard pan direction. You can set the camera to default configurations via the camera home positioning button. The commander has an autofocus button as well as a button to select the 3 different IR frequencies assigned to the camera. You can recall and erase 6 preset configurations using the 2 button on the controller. It includes buttons for altering the zoom speed and for manually adjusting the focus of the lens. In addition, this system includes a power supply. The Quick-Connect Short Range Video Interface from Vaddio allows you to install and power remote Vaddio cameras. With a single Cat-5 cable, it connects with the camera. The interface powers and controls the remote camera and receives HD video from the camera at up to 150 feet away. This unit is compatible with all Vaddio PTZ and POV cameras. The Short Range Interface provides a local access to an HD monitor via a 15-pin Sub-D connector as well as infrared connectivity. The IR infrared output allows you to send IR remote controls to third party equipment, such as videoconferencing codecs. The IR signals can be transmitted as either modulated (through the air) or non-modulated (wired) signals.